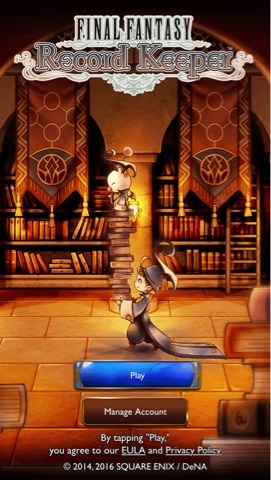 Ever since I started playing Final Fantasy Record Keeper last year, I’ve noticed mobile games becoming more and more a standard part of my gaming life. This is somewhat surprising to me, since when I used to bring up the topic of mobile games to my friends, they were regularly talked about as lesser experiences when compared to console games. Despite this, when the port of the original Final Fantasy became my first venture into the world of mobile games, my expectations of them became very high very quickly. I was completely addicted to the old school JRPG and the best part was that it lived in my pocket. As much as I love my portable consoles, there's a lot to be said about having everything on one device, so this Final Fantasy experience carved out the beginning of my enjoyment of smartphone games. I had paid money to play the original Final Fantasy game on iOS, so when I saw Final Fantasy Record Keeper was free, I was ecstatic. With a majority of my Final Fantasy experiences on consoles, I had always paid for my Final Fantasy games up until that point so I couldn't understand how I was getting Record Keeper for free. The best part was that it was a great game and had hours and hours of gameplay, with more levels being regularly added even now. I thoroughly enjoyed Final Fantasy Record Keeper so much so that I gave it my Game of the Year last year, but there was one thing that the game was missing - story content. The simplified version of Final Fantasy was fun, but it had no chance of fully replacing a console Final Fantasy game. Regardless I played Final Fantasy Record Keeper multiple times a week because of its nostalgia factor, it's fun combat and just how easy it was to jump in and out of during my day. My mobile game routine has changed a lot recently though. This year has seen the release of three mobile JRPGs I really enjoy - X-Tactics, Kingdom Hearts Unchained χ and Final Fantasy Brave Exvius. While playing these three games, I noticed how whether it was innovative gameplay, great collectibles or finally having some form of story on my phone, there were deeper JRPG experiences available on smartphones, I just hadn’t looked for them yet. And again these experiences are all wonderfully free with optional payments for extras available that don’t interfere with the main gameplay. 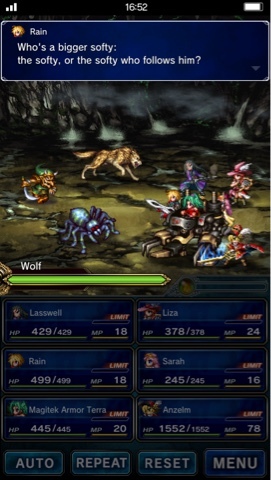 Final Fantasy Brave Exvius was released recently and really got me thinking about the quality available in free smartphone games. I’m not that far into the game but already I can fulfill my basic JRPG desires. I can explore towns and areas, complete quests, do boss battles and enjoy an interesting story on my phone. It remembers exactly where I am no matter how suddenly I have to close the app and with levels that are fairly quick, I can get quick satisfaction out of finishing a level during my work day. It has so much content that I can say with confidence if this was a cheap Vita game, I’d probably pay for it yet it’s available for free on my iPhone, regularly updated, made better and only costs me money if I want extra in-game items. I love huge dungeons, quests and levels as much as the next JRPG player, but smartphone games have made me realise there's plenty of fun to be had in small levels too and it's nice to have the option of both types of experiences. Somehow we live in a time where we’re spoiled as gamers on-the-go. With payment being mostly optional on smartphone games, we’re somehow getting these great smartphone experiences for nothing, which is pretty amazing considering the price of any full-priced console game. They’re not fully at the level of console games since I can’t play any game as modern, elaborate and long as my favourite game Persona 4 Golden on my smartphone yet, but it makes me wonder if there will something like it on my smartphone in the future. For now, I’m glad to be trying out more smartphone games and hope to find more elaborate JRPGs to play on the days I don't pack my 3DS or PS Vita . I’m enjoying the direction smartphone JRPGs are going in and am excited to consider it in the same league as my portable consoles. All games mentioned in this post are available in both the App Store and the Google Play store. What's your favourite smartphone JRPG (Please let me know - I wanna try more)? What are your thoughts on Smartphone games?